Eddie Puga has been the Pastor of Iglesia Bautista Ambler in Abilene for four years. This small bilingual church partners with churches along the border, and is faithful in their giving to the Texas Baptists Cooperative Program and the Mary Hill Davis Offering. Pastor Eddie sacrifices much for the church. He was able to help the church get out of debt. But, as a husband, full-time pastor, full-time seminary student on scholarship, and a new father to four foster children, his own finances were tight. When the weight of it all seemed too heavy, he reached out to Tammy Tijerina, director of Texas Baptists’ Center for Ministerial Excellence (CME). Tammy walked Eddie through the application for CME’s Ministerial Excellence Matching Grant, where Texas Baptists pastors and church ministerial staff can apply for up to $5,000 in financial relief. Eddie was able to receive the full amount of funds by matching the funds that he and his wife had saved. 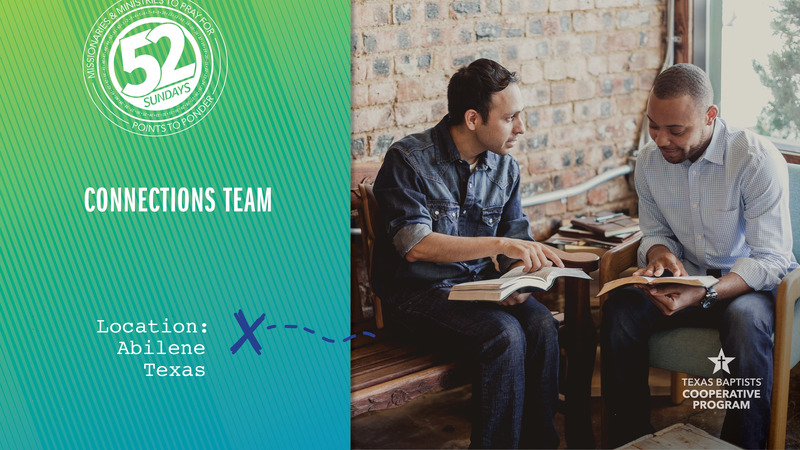 Our church’s Cooperative Program gifts help fund the Texas Baptists Connection Team as they facilitate the work of CME. Let’s pray for Tammy and CME as they assist pastors in Texas.